Retro Easter candy encompasses a lot of candy varieties on our site. Some of it is older, some is classic candy done up in a new way, and some is just so simple and delicious that it reminds you of the good old days of straightforward sugary candy. Let’s tell you about some of the fun retro Easter candy we’re featuring this spring. As you can see above, Dessert Shop Easter eggs filled with candy are nice and colorful and ready for the holiday. 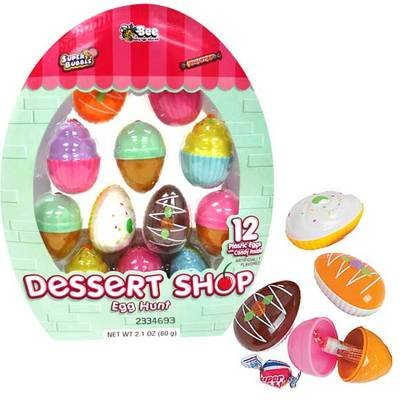 Each plastic egg is shaped like a different dessert, including doughnuts, cupcakes, and ice cream. Inside each of the 12 eggs is some Dubble Bubble gum or Smarties. What a fun Easter egg hunt candy these will make! Similar to these are our sports ball eggs filled with candy. With spring finally here, you’ll be outside playing a lot more sports than in the winter, and Blair Candy is ready. Enjoy bubble gum or Smarties inside Easter eggs that look like basketballs, baseballs, footballs, and soccer balls. Also perfect for Easter candy baskets are Jelly Belly trial-size gourmet jelly beans. Each bulk box comes with 80 little packets of jelly beans. These cute and colorful jelly beans are sized just right for giving out to friends and family this Easter. Come shop all of our retro Easter candy at BlairCandy.com right now, before it sells out!